In North America, there are more than 300 different species of crayfish. This crayfish is known by many different names, mostly depending on the geographical location of the country. Among the common names are crayfish, crawdads, crawfish, and mudbugs. Classified as a crustacean, the crayfish is a cousin of the lobster. Crayfish require clean water to survive, and can be found in ponds, lakes, rivers, and streams, where they live as bottom dwellers among the rocks. Some species of crayfish have life spans of five years and can grow to lengths exceeding six inches. Crayfish adapt their body color to blend in with the waterway they inhabit. They can be various shades of green and brown, some light in color and others very dark. Some species of crayfish that I have encountered have a orange-red underbody. Larger crayfish tend to be light sensitive, so most activity occurs during the night or periods of low light. Young crayfish can be active during the daylight hours. Like their lobster cousins, crayfish have outside skeletons, called exoskeletons. As the crayfish grow in size, they outgrow their existing exoskeleton, which is a process called molting. After the crayfish shed their exoskeletons, they grow new ones. Crayfish are predators and scavengers that will hunt and feed upon aquatic vegetation, fish, and fish eggs. In southern climates, they are active most of the year unless water temperature drops. 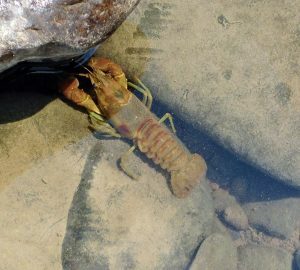 In northern climates, once water temperature drops below 55°F degrees in the fall, crayfish become dormant, burrowing under rocks or burying themselves deep in the underwater silt. In this dormant stage, they will not be seen again until the water warms in the spring. In the southern states, crayfish are considered a delicious meal and are enjoyed by many people. Louisiana produces most of the harvested crayfish in North America and many are commercially farmed in large-scale aquaculture operations. It was not until recent years that people elsewhere in North America have discovered the delicious and easy-to-acquire crayfish are often found within the water nearby their homes. Crayfish are a healthy source of organic food: each serving has 16 grams of protein and is high in omega 3. Possessing a sweet, succulent meat, crayfish are truly a delicacy. If water is clean and well oxygenated, crayfish are likely to be present. Crayfish prefer rocky sections in streams and rivers and will be found within water depths that usually do not exceed six feet, so harvesting is not a difficult process. 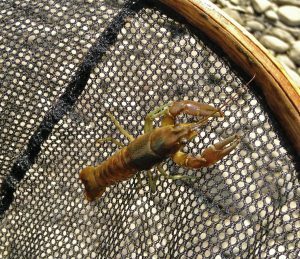 Readers should consult with their state’s fish and game laws before harvesting crayfish. During the evening or low light conditions, many crayfish will be located in the shallow water of streams and rivers. With a fine mesh net in hand, a crayfish hunter can scoop up crayfish in the shallow water. Often the crayfish will be visibly exposed, and others can be located by lifting up underwater rocks. When frightened, crayfish are quick movers, propelling themselves rapidly backwards with their tails. To catch them, place the net behind the tail section, and use your hand or foot to approach close to the front of the crayfish. When approached, the crayfish will scoot backwards into the waiting net. There are other techniques to capture crayfish. Another simple technique is to tie a piece of kite string to the end of a four- to five-foot-long sturdy stick. Lower the bait, such as a large section of fresh fish or chicken, into the bottom of the prime crayfish water. The crayfish will come and latch onto the bait after a few minutes. The bait can be gently lifted out of the water and the crayfish plucked off. In a lake or pond environment, a used tire can be used to capture crayfish without bait. Tie a rope to the tire, and toss the tire out into the water, allowing it to sink to the bottom. After a few minutes, drag the tire back to the shoreline. The dragging motion will scoop up any crayfish within the path of the tire. Commercial crayfish traps are readily available for purchase through mail order companies. For instance, Cabela’s sells a Frabill crawfish trap for a reasonable price, and it is very functional. But if you don’t want to buy one, a workable homemade model can be constructed out of an empty plastic gallon jug. Cut a hole roughly 2½ inches in diameter in the end and put the bait within the container. 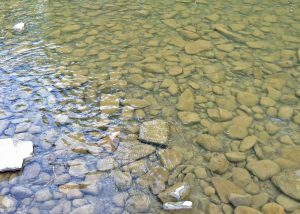 A rock or brick can be tied to the jug to make it stay on the bottom. With any baited trap, use a good-sized piece of bait to keep the attention of the feeding crayfish. Once crayfish are captured, promptly put them in a container filled with water to keep them alive. During an extended outing, the water will have to be refreshed by adding replacement water, as the crayfish will rapidly use up the oxygen content within the water in the container. If crayfish are heading home to your dinner table, they must be kept alive. If a crayfish dies during the transportation process (if the crayfish are not moving when touched, they are deceased), dispose of that crayfish. Preparing crayfish for the dinner plate is easy. As noted before, the crayfish must be alive. Rinse the crayfish in clean water to remove any debris. When cooking a few dozen crayfish, bring two to three gallons of water to a boil within a large pot, and stir in approximately one pound of non-iodized salt. Boiling times will vary with cooking technique. Crayfish have what is commonly known as a “mud vein” along their back section. This vein, which is actually the crayfish’s digestive track, will be dark in color. It should be removed with a thumbnail or the edge of a knife before eating or additional cooking. Crayfish are delicious when you perform a secondary cooking in melted butter. To accomplish this, you must first boil the crayfish. After placing the live crayfish within the pot of boiling water, the water temperature will drop. Wait for the water to resume a full boil and boil the crayfish for approximately six minutes. The crayfish will float to the surface and turn bright red in color. Carefully remove the boiled crayfish and place in ice cold water for a couple minutes to allow for handling. When cool to the touch, use two hands and grab the head section with one hand and the tail section with the other hand. Twist in opposite directions, splitting the crayfish shell in half above the tail. Squeeze the sides of the tail section until the shell cracks. Carefully peel away pieces of the shell, then pull the tail meat out of the shell. Using a knife, trim off the tail section on the end. While the crayfish meat is being acquired, heat a skillet pan on medium heat with a half stick of melted butter. Stir crayfish tail meat into the melted butter and cook for an additional five minutes. For adventurous cooks, the butter can be infused with garlic or other favorite seasonings. Crayfish can also be dipped in a spicy sauce before consumption. Experiment with adding crayfish to existing recipes. Crayfish have a texture which is softer than shrimp and can readily be used in any recipe that is normally used with shrimp. Instead of removing the mud vein, you can purge the crayfish before cooking. This is a time-consuming effort, but the end result is a cleaned-out intestine. Purging is accomplished by placing the crayfish in clean water for at least 12 hours. The water must be replaced every 30 minutes, or the oxygen content will get dangerously low within the water. If an aerator is available for immersion into the water, use it to keep the crayfish alive by providing a constant source of oxygen. With the crayfish not eating additional food, the digestive tract will be empty in about 12 hours. If an aerator is not used, be aware that many crayfish inside a container of water will use the water’s oxygen quickly, and more rapid water changes will be required.